Put dried white bait in a bamboo basket. Pour boiling water over and drain it. Soak wakame seaweed in cold water for 10 minutes and drain it. Cut into small peaces. Slice green perilla (shiso) leaves thinly. Put the wakame seaweed in a bowl. Add (A) and mix well. Bring water to a boil in a large pot and add salt. Boil the pasta in the salted water. Rinse in cold water to cool and squeeze out the water. And put it into the bowl with the wakame seaweed and mix well. Arrange on individual plates. 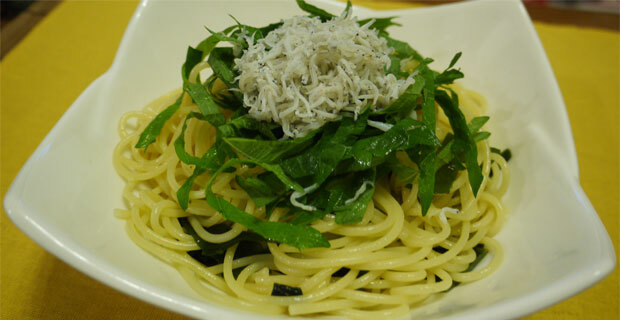 Put perilla (shiso) on the pasta. And put dried white bait on the perilla.